A heart pin with a miniature flower garden will add a pretty touch to your outfit! 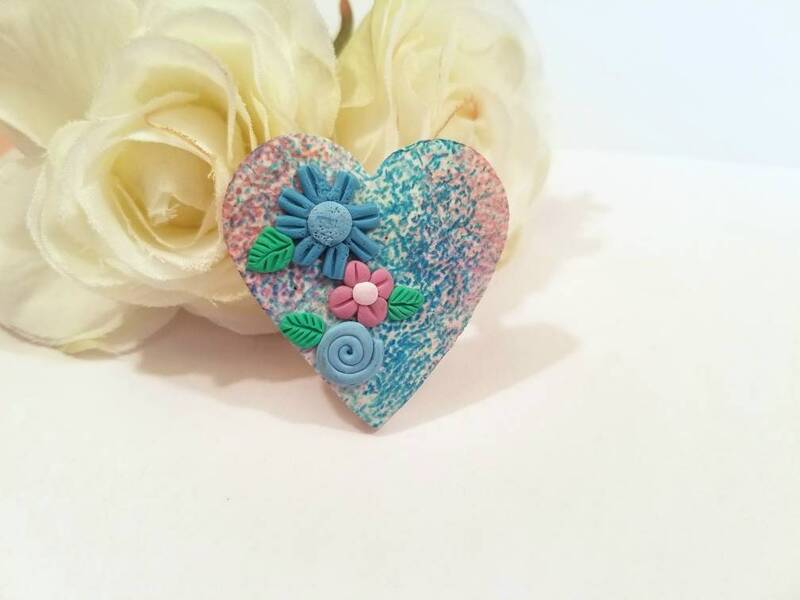 The heart is handmade of white polymer clay and colored with pink and blue ink. Tiny flowers are made of pink and blue clay with green leaves. Measures approximately 1 1/2 x 1 1/2 inches (3.8 x 3.8 cm). Finished with a pinback with safety clasp. For any special occasion, a lovely gift you won't find anywhere else! Add a bit of whimsy to your life! My daughter will love this! Very prompt and good quality. Received this much faster than the delivery estimates suggested. The colours are warm and vibrant, and the design is nice and clear. My partner was very pleased to receive it as a gift, and has been talking about all the old times it reminds her of all day. Payment is expected at the time of sale. OUTSIDE THE USA (International): International customers: please be aware that your country may charge you taxes, duties or fees on delivery, and that these will be your responsibility. All of my customs forms are marked as "merchandise" and include the full amount paid for the item(s), minus shipping. Your satisfaction is very important to me! If you wish to return or exchange an item, please contact me within 14 days of your purchase. Items returned must be in like-new condition, and refunds do not include shipping costs; buyer must pay shipping for returns and exchanges. IF DAMAGED IN SHIPPING, please message me with a photo, and we will arrange for a replacement item (I will pay for shipping). CUSTOM ORDERS: No returns or exchanges accepted. While not as fragile as glass, polymer clay should be treated "gently." Each item is packed with care to protect it from shipping damage. Recycled materials in like-new condition are used whenever possible. If your order is damaged in shipping, please message me with a photo, and we will arrange for a replacement item. I will ship your purchase by USPS First Class Mail or Priority after payment is received and e-checks have cleared. Books are sent by Media Mail. ♥ HANDMADE POLYMER CLAY creations will last for many years with gentle care. While not as fragile as glass, clay can break or chip - avoid dropping on hard surfaces and protect from sharp objects which might damage the finish. -When traveling with jewelry or storing ornaments, pack in bubble wrap or soft towel. Don't stack anything heavy on top of clay items. -Store in a dry, cool place away from direct sun. -Clean with mild soap and water, dry with a soft towel. -Colorful clay pieces can be mistaken for “doggie treats” or "cookies." Keep out of reach of PETS and SMALL CHILDREN. ♥ Follow these simple care tips and enjoy!